Many of our meetings are just about teaching people to pray emergency prayers instead of teaching them about a strong relationship with God. Just praying emergency prayers in time of trouble is like using God as a spare tyre when u have a flat.No one likes being used as spare tyre. The absence of a working relationship with God amongst Christians is the reason why they find it difficult to recognise the voice of d Lord. Sister, if you don’t know how to hear the voice of The Lord, your chances of marrying a bozo, crook or fraudster is well over 80%. Power & punch through d Holy Ghost in the lives of church folk has now been replaced with powerless motivational words that can’t hurt satan. The supernatural power of the gospel is now being replaced in church with empty words that don’t require a genuine commitment to Christ. Christians r now being led by their #SoulTies & intellectual junk. They cannot boldly declare in public that they heard d voice of d Lord. We are presenting a gospel that carries no convicting power of d Holy Spirit wit words that don’t require a circumcised heart to understand. 3 Hebrew children refused to bow and they didnt burn. Are you vowing to worship Jesus or bowing to worldly compromise cos of bread & butter? Saints cannot even discern the difference between a true believer or an impostor. We ought to be able to know people by the spirit. The days when sisters sought d voice of The Lord before saying “Yes” are now replaced with enquiries about d brother’s financial net-worth. The days when brothers sought d face of The Lord before proposing are now replaced with days of ‘test-drives’ to verify sexual performance. Our search for love has stolen our reverence and affection for God that we have made an idol out of relationships. 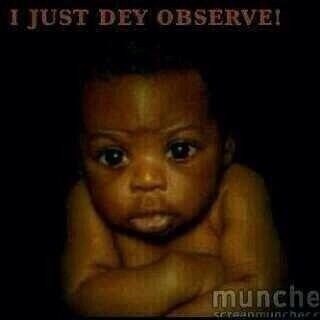 I just dey observe sha.